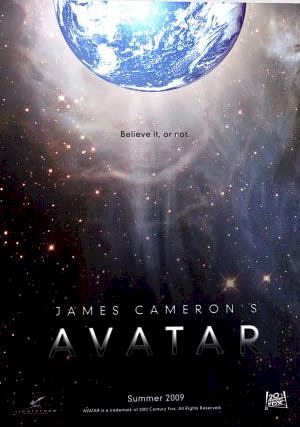 I was encouraged to see Avatar by my children who thought it was interesting and worth seeing. They saw it in London with all the 3D frills. So along I went with a friend in Quito. No 3D experience in Quito! The movies here only cost $4.35, the cost is geared to the local budget and there are no frills. It was a bit blurry actually seeing it without the 3D glasses. I always look at these Hollywood extravaganzas with an eye to what the Illuminati message is this time. So another good prevails over evil, David against Goliath, scenario, with a bit of interesting technology exhibited. The beauty of the James Cameron "Pandora Environment" creation must have been fabulous in 3D. My first impression was that the Na'vi of Pandora look like what some Galactic Star People actually look like. They vary in height but many are over 8 feet tall and the Na'vi were 16 feet tall with a tail, and the blue skin color and green/gold eyes are one of the many different combinations existing throughout our Galaxy. The appearance of these Star People is what is known as humanoid feline entities or paschats. It is proposed by some that the Sphinx, for instance, is a Paschat called Sekhmet. The face on Mars which has a similar appearance may also be a Paschat. See my article on "First Contact What Do the Star People Look Like?" which has a lot of information from several sources who have had interaction with at least 57 different humanoid Star people visiting earth and interacting with various secret military programs in the last 60 years. We know that President Eisenhower met some Star people and subsequently had a heart attack from shock. His last speech warned us about the Military/Industrial Complex. We have recently had published confirmation from his daughter that he had initially intended to say "Military/Industrial/Congressional Complex " but thought it would create panic and so deleted "Congressional". Back to the movie" the parallels between "Avatar" and our earthly existence now are many and obvious"
the value of money is placed over and above the well-being of mankind both on Earth and the Universe as a ruthlessly pursued priority with no respect or consideration for environment, habitats, lifestyles or life at all. Implementation of massive aggressive military power treats soldiers as expendable mere pawns of the system who have to follow orders or else. The parallel model here on Earth that has been in operation for thousands of years and is ongoing, is evident here in South America where we have the destruction of whole ecosystems with the annihilation of forests, degradation of soil and water with cancer causing toxins caused by Big Oil that are decimating the Indigenous tribes of Ecuador. They are fighting to have their habitat restored in court cases in the US that have been going on for years and they may never get restitution of their environment before they are all killed off. The movies, reports and court cases of similar abuse and destruction in the US and all countries around the globe are well known, documented and too great to recount here. So the fictional movie "Avatar" has a lot of messages from the Illuminati about the state of our technological development and agendas of the dark forces. We are being told that mining of space is underway. We are being shown the state of the art of the war machines. We know that drones are being used in great numbers in Pakistan but these are not as sophisticated as the models in "Avatar". Super Soldier Mind Control programs have been going on for 60 years and are well documented by former operatives in these programs now coming out of their programming. See Duncan O'Finoan's Project Camelot interviews. The transformer-like machines in the film that the soldiers controlled reminded me of the transformer toys that were popular with boys in the early 80s. My son had some, although generally I did not encourage things like that with my children. So back then the Illuminati were acculturating our children into this type of technology" another type of mind control. Many of these machines now being produced have AI (artificial intelligence) and soon will replace human soldiers. When will the madness stop? What I really resonated with was the portrayal of the Na'vi and how they practice the Law of One, their connection and respect for all living things, their environment, their spirituality, personal lifestyle disciplines and initiations which again resonate with all indigenous cultures and their spiritual practices; their respect for all animals as entities on a dimensional path evolving as we have all done during our individual collective experience; their ceremony of joining together in their meditation and focus of energy to shift the lifeforce from one body to another. This experience is similar to NDEs and OBEs (near death experiences and out of body experiences) experienced by millions of people and well described in Michael Talbot's "The Holographic Universe". What fascinated me was that the process of the transfer of lifeforce from Jake Sully's human body to the Na'vi body was not explained but was graphically shown as a spiraling light tunnel as in NDEs. This spiritual force is obviously our eternal spiritual entity that inhabits our body and passes over when we finish this lifestream, before going to another experience or another lifestream, being graphically shown in the movie. This is not fiction. Nobody is alive without it. This "dreamwalker" experience was very similar to the Astral Travel that most of us do at night when we are asleep, whether we are aware of it or not. All this is confirmation from the Illuminati that they are aware of our abilities and are acknowledging them in this film. This is consistent with the secret knowledge that has been hidden from us by secret organizations for over 10,000 years and has been dribbled out in movies over the last 20 or so years. These secret rituals can be used for good or evil and were practiced by both the Law of One and the Sons of Belial in Atlantis and many other ancient cultures. The wisdom was taken to the Mediterranean countries by survivors of the destruction of Atlantis and became the basis of knowledge for Egypt, where the priests had the knowledge and a secret language and appointed pharaohs as their ruling puppets. The priests always retained the knowledge and do so even today. The wisdom was corrupted and distorted over the years and through the current secret societies who are the "priests" of today, has been used for evil self-serving agendas that have created our current environment. See Drunvalo Melchisedek "Flower of Life" parts 1 and 2 for this knowledge of initiations and rituals. Also David Wilcock has much information on his site www.divinecosmos.com . I am sick and tired of all the violence portrayed in these movies. I feel numbed by the amount of it now everywhere. Mindless aggression without emotional response or personal liability is portrayed as normal. It is not. It is a truth acknowledged that if our soldiers threw down their guns today and refused to use all this horrendous military hardware, all wars would end. If man does not control this situation himself who can? We are all responsible in various ways and each has a role to play in our collective destiny. Families encourage their children into the military for benefits like education and career opportunities in a declining job market". If they should live so long and survive the psychological implications of the traumas experienced in their future lives! The Na'vi with their Avatar, Jake Sully, overcame the horrendous Sky People (us) and all their technology with bows and arrows. We can too. All we have to do is put our mind to it and choose our destiny. If nothing else, "Avatar" is a good morale boost for beleaguered humanity to take back their power, focus on their desired reality, restore their values, habitat, lives, potential and ensure our golden future on Earth. Let's do it!